Mark's Tickets is the best place to find tickets for Minnesota Twins fans. Just check this page for any new events or schedule updates throughout the year. We sell tickets to every Minnesota Twins game around the world. We know how passionate Minnesota Twins fans can be about baseball, so we make sure to have hundreds of tickets for every game available right up until it starts. For those looking for cheap Minnesota Twins tickets, we offer tickets starting at very low prices (many times below face value). 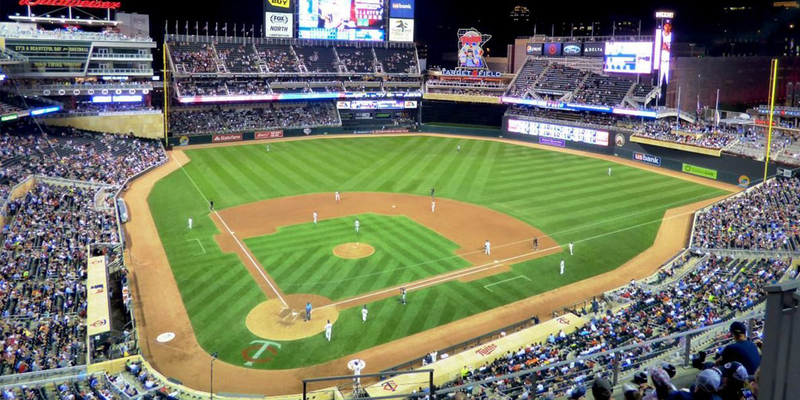 We offer tickets in most sections of every venue that you can see Minnesota Twins. Simply choose the city or venue that you are interested in below, and you will be able to see all of the available seats. Do not forget that Marks Tickets also specializes in sold out Minnesota Twins tickets. No longer will sold out shows prevent you from seeing Minnesota Twins. The Minnesota Twins are a professional baseball team that plays in the MLB. The Twins play their home games at Target Field in Minneapolis, Minnesota. With 162 games per year, and 81 being home games, The Minnesota Twins are a professional baseball team based in Minneapolis, Minnesota. They play in the Central Division of Major League Baseball's American League. The team is named after the Twin Cities area comprising Minneapolis and St. Paul. They played in Metropolitan Stadium from 1961 to 1981 and the Hubert H. Humphrey Metrodome from 1982 to 2009. They played their inaugural game at the newly completed Target Field on April 12, 2010. The team was founded in Kansas City in 1894 as the Kansas City Blues of the Western League. The team moved to Washington, D.C. in 1901 as one of the eight original teams of the American League, named the Washington Senators or Washington Nationals. Although the Washington team endured long bouts of mediocrity (immortalized in the 1955 Broadway musical Damn Yankees), they had a period of prolonged success in the 1920s and 1930s, led by Baseball Hall of Fame members Bucky Harris, Goose Goslin, Sam Rice, Heinie Manush, Joe Cronin, and above all Walter Johnson. Manager Clark Griffith joined the team in 1912 and became the team's owner in 1920. The franchise remained under Griffith family ownership until 1984. In 1960, Major League Baseball granted the city of Minneapolis an expansion team. Washington owner Calvin Griffith, Clark's nephew and adopted son, requested that he be allowed to move his team to Minneapolis and instead give Washington the expansion team. Upon league approval, the team moved to Minnesota after the 1960 season, setting up shop in Metropolitan Stadium, while Washington fielded a brand new "Washington Senators" (which later became the Texas Rangers prior to the 1972 season). Success came quickly to the team in Minnesota. Sluggers Harmon Killebrew and Bob Allison, who had already been stars in Washington, were joined by Tony Oliva and Zoilo Versalles, and later second baseman Rod Carew and pitchers Jim Kaat and Jim Perry, winning the American League pennant in 1965. A second wave of success came in the late 1980s and early 1990s, led by Kent Hrbek, Bert Blyleven, Frank Viola, and Kirby Puckett, winning the franchise's second and third World Series (and first in Minnesota). Through the 2012 season, the franchise has won three World Series championships (1924, 1987, and 1991), and has fielded 18 American League batting champions.